The Fiddler Group Slices, Dices, Chops — even Shreds — the Brand Biz. After the Gap logo fiasco, it’s nice to see an iconic brand refresh their logo in the right way, with all the right reasons. With their brand going increasingly global and brand extensions on the near horizon, it made perfect sense for Starbucks to lose the English language as well as the reference to “coffee” on their logo. But rather than lose what was great about their branding, they chose to fortify it, bringing their iconic “Siren” to the fore, free at last from the concentric circles. It’s bold, beautiful, and respects the heritage of the company in a timeless way. 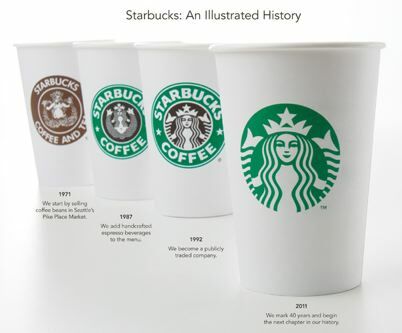 Not only is the logo itself wonderfully conceived and crafted, the way Starbucks released it, in commemoration of their 40th anniversary, was well done, too. All you need to know is posted on their site, along with a nice little video with Chairman Howard and little pieces from their Senior Creative Manager and Senior Writer about the technical aspects of the new logo and the history of the Siren, respectively. It’s tough not to appreciate the clarity of their thought. Don’t be afraid to evolve your branding with your brand periodically. Don’t be afraid to keep what’s good. When you do evolve your branding, make sure you explain it in the larger context of your customers and your company. Take the opportunity to celebrate your brand. If you don’t, who will? “Oh, what do you think of it?” I asked. “I haven’t seen it yet. But I think they would have been better off taking all the money they spent on it and given their employees a raise. It would have pleased more people.” That drew approval from the rest of the crew behind the counter. So I guess there’s a fourth piece of learning here: Before you rebrand, let your employees in on the secret. Where’s the seasoned beef? Who cares? AIDA’s dead. Give it a rest. Where's the seasoned beef? Who cares?